Having a Stress-Free Birthday Party! 1) The most popular time to have a children’s birthday party is at 2:00 pm on a Saturday. This is because people are often free, and it is not close to lunch or dinner, so a meal is not necessary. This also makes it a bad time to have a party because other parties will be competing with yours for that time slot. I personally think 2:00 pm on a SUNDAY or after school/work on a Friday are good because there is less competition for your guests. Some schools & preschools allow parties at school. This cuts out competition completely and makes the party much easier for you. 2) Outdoor parties are never as good as indoor parties when it comes to this type of entertainment. Outside it can be too hot, too cold, too windy, or it can rain. Insects can factor in. If you want to have an outdoor party, please try to have the magic indoors and the rest outside. I won’t have kids running around breaking and spilling things at my parties — I keep them occupied! I have found that having a party outside in the yard can actually cause more problems inside the house than having the whole party inside. Children track in mud and other things. If a child has to use the bathroom, he or she can end up wandering all over the house unsupervised. Children often bring outside behavior inside and can accidentally break, stain, or otherwise hurt your home by running and playing roughly. At an inside party the kids are closely supervised and that red Kool-Aid never gets into the living room to be spilled on the rug or furniture. In thousands of parties, I have seen very little of this if a party is just indoors. REALLY! 3) Children like simple food. Children aren’t fussy; they just want something quick and easy so they can get back to enjoying the party as soon as they can. Plain cheese pizza and chicken nuggets are sure hits. Fancier foods can be a smash with the adults. 4) Some children will ALWAYS arrive late, and disrupt the party as everyone rushes over to greet them and tell them what has happened. To avoid this, it is best to have the entertainer arrive after the party has been going on for about a half hour. This gives the children plenty of time to meet and greet. Hopefully there will not be any distractions by late arrivals. 5) AIR CONDITIONING! This is an active party. With kids jumping up and down for an hour, things can get HOT. Crank up the air conditioner BEFORE the party starts. It should be a little too cool . . . Don’t worry, the kids will warm things up! 6) Parents are VERY welcome at the show! Parents are sometimes needed (even if the children think not! ), but in the past, the adult conversations have created MAJOR distractions for the children. We all are disturbed when children talk at the theater. Well, this is the children’s theater! 7) Name badges/stickers for the children help keep the order, and then every adult can address a child with the child’s proper name. It also can make things more personal to your guests when the entertainer calls them by their first name. 8) Toddlers are welcome to enjoy the show, so long as the toddlers can sit with their parents and won’t go walking around the older children! The kids get very excited and can easily not see a baby in their midst. Toddlers often like to come and visit the entertainer during the performance, and that can slow down the party, too. 9) The show is very interactive, and the food will slow everyone down. A child can also choke when laughing with a mouthful of food. Plus, eating and drinking before or during the show can cause stains! Not only can a spill damage your carpet, but it stops the show until it is cleaned up. Considering the entertainer is paid by the hour, that is also expensive! 10) Turn party preparations into a family project! You have less work to do AND your children will feel they helped make the party a success! 11) Make a realistic estimate of how much preparation time is involved and how much time you can devote to party preparation. Things always take longer than you plan. 12) Start preparations early. It is much easier to find 15-30 minutes per evening than to do it all the day before the party. 13) Shop smart. Make a list of things you need and where you can get them. 14) Noisemakers, balloons, and other distractions like TVs and radio can split the children’s attention. To maximize the magical effect, it is best to keep distractions to a minimum during the party! 15) Often a child who wants attention will start playing with your child’s toys if they are available. These “new” toys will always be a distraction to the children anyway, and if you wish, there will be plenty of time to play with them later! 16) The presents are the least entertaining, and once opened can be very distracting! Opening presents can be very boring to many younger children – especially if there are a lot of children. Bored children can be problem-causing children! 17) You will wish you had plenty of film and batteries for your video and still cameras if you forget them! 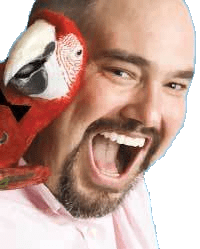 Many clients want lots of action shots and poses with parrot Jax. This will only happen once, so be ready! 18) Children LOVE theme parties! Getting into a theme is not hard! Buy and/or make decorations. Use themed food. Use the themed invitations, jokes, etc. All of them will garner excitement and help make your party unforgettable! Really, this works wonders! 19) Birthday parties can be very stressful for younger birthday children in particular. They really love it, but sometimes they do not want to interact due to all the fuss being made over them. Relax; this is normal. They are having a good time just watching all the excitement! At the end they are the stars. Then they are generally receptive to attention because they are acclimated to the party. 20) Your pets will be fine, but keeping everything but the fish locked in a bedroom will lesson the chance of a disruption! Remember Jax is a big parrot; she is used to dogs, but they are rarely used to her! Dogs also can get overly excited by the party and accidentally knock down children and lamps! 21) I believe it is best for parties to end on a high note – two hours to two and a half hours is an ideal time for a successful children’s party. 21) Children who are not within a few years of your child will often feel out of place at your child’s party. Seven year old Jimmy may play with his three year old sister at home, but neither he nor his friends will probably play with younger children at your child’s party. 22) It is tempting to invite more children to your party than your house can handle. The entertainer will keep all the kids entertained, but you will have to manage them during the meal. 12 to 20 is a good number for a house party, and 20 to 30 is a good number for a hall. 23) Some children are often shy around strangers, and with so many people over for the party, a child can become even more shy. Please let your children, and their invited guests, explore this web site. This will get them ready to fully participate in the party because they will “know” the entertainer, and he will be less of a stranger. Surprising younger children with ANY entertainer is courting disaster – many children do not take well to big surprises.